Read in this post which drone laws you have to observe in Madagascar. Since March 2015 you have to apply for a permit if you want to put a drone into operation in Madagascar. Apparently, permits are not granted for private drone users. As a private person, you are only allowed to fly with a drone indoors, as no permit is required. To obtain a permit, you must complete a four-page form and send it to Aviation Civile De Madagascar (ACM). In the application form, you must provide information about yourself and the used multicopter (e.g., ascent weight, number of rotors). From the form, I read that permission must be obtained for each flight. Personally, it would be a too bureaucratic effort, and I would leave my copter at home on a trip to Madagascar. 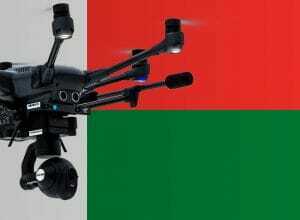 We have researched the listed drone regulations for Madagascar to the best of our knowledge. We cannot guarantee the correctness of the information. If you want to be on the safe side, contact the competent aviation authority. Alternatively, you can also ask the embassy in your country for further information about the regulations. Please leave us a comment when you receive news and/or gain experience with your copter in Madagascar! Hi Francis. I am schedule to traveling to Mauritius , Madagascar and Namibia this May & June. I would like to travel with my drone (DJI Mavic Pro), I knew there is no need permit in Mauritius which is okay, and permit in Madagascar, but I will not to use it, so it is fine also. Regarding Namibia, I hear they need to apply permit ?? do you know how and where can apply permits ? is that difficult ? Appreciated your kindly attention and help. Did you manage to go to Madagascar with a Drone. I am going in July and wanted to take one. HI, I have an house in Nosy be and i leave there e few months . I would like to use a drone on the beach. do u think I need a permit? If yes, how can i obtain it?